a book chick: "Some Luck"
my take: I was a little freaked out at the beginning of this novel: a nine month old is sitting alone, looking around seeing doors shut and people far away. I thought for sure he was a goner. This is the first time I've seen life through a baby's perspective and the world seems precarious. He survives childhood on the farm, which is more than can be said for other characters. When it became evident that each chapter is successive year, beginning in 1920, I quickly realized that life on the farm was going to get very harsh as the Crash and the Dust Bowl lay ahead. Much to my delight, this is the first in a trilogy which will chronicle 100 years beginning on the Langdon farm and following their family. This first installment covers post The Great War, the depression, World War II, and into the 1950's. A fascinating look at American history from the perspective of the Iowa farmers and following generations. BFF Susan says she has the next volume. Which I can't wait to read. my source: Found whilst browsing Schuler's massive used book section. Love. 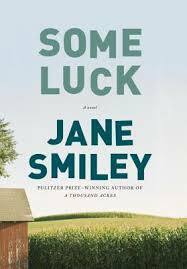 Haven't read Jane Smiley in a long time - eager to read this one! "Depression era Iowa" seems like it's going to be like "set in Russia" - bound to be, er, depressing. But it sounds worth a read, especially with the series potential - will add to my "to borrow" list!